Osticket Mobile App - Easy and Simple to use - The OsTicketapp (eTicket) has the same features as the actual Osticket application plus push notifications to your mobile device. Other features include the ability to create, edit, assign and delete. We have made setup of the OsTicketapp on your phone seamless. All you will need to connect your mobile device to the application is your URL, username and password. OsTicket App now supports v1.10. The OsTicket App is a mobile application that directly integrates as an OsTicket mobile app. The OsTicket App (eTicket) has all of the great functionality of the Osticket managment system control panel. The Osticket Mobile Application is easy to install and operate. There is very little you have to get the eTicket app to work with Osticket. 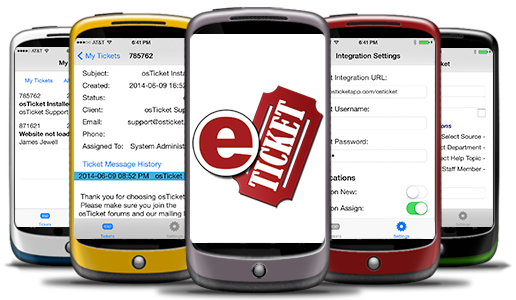 The OsTicketapp (eTicket) has the same features as the actual Osticket application plus push notifications to your mobile device. Other features include the ability to create, edit, assign and delete. We have made setup of the OsTicketapp on your phone seamless. All you will need to connect your mobile device to the application is your URL, username and password. We have developed an API that connects your mobile device to the application in real time. The API requires no setup to connect it to your OsTicket application, we have done all the work for you. eTicket has been specifically made to integrate with the OSTicket Support Ticket System (http://osticket.com). We have made this app initially for ourselves and thought we'd share what we've made. With this app, you have the ability to view all open tickets, assigned (to you) tickets, and closed tickets. You can reply, assign the ticket, close the ticket, re-open the ticket, or create new tickets all within the app. With the mobile Osticket app you can receive push notifications when you have new tickets submitted to your system, replies to your tickets, or tickets assigned to you. Additionally, you can turn these notifications off within the app, or pick and choose which notifications you wish to receive. To use this app, you MUST have the OSTicket System running on a web server and have access to FTP/Upload files to the system. Please contact us if you do not understand prior to purchasing the app, we can help. Download the API HERE.